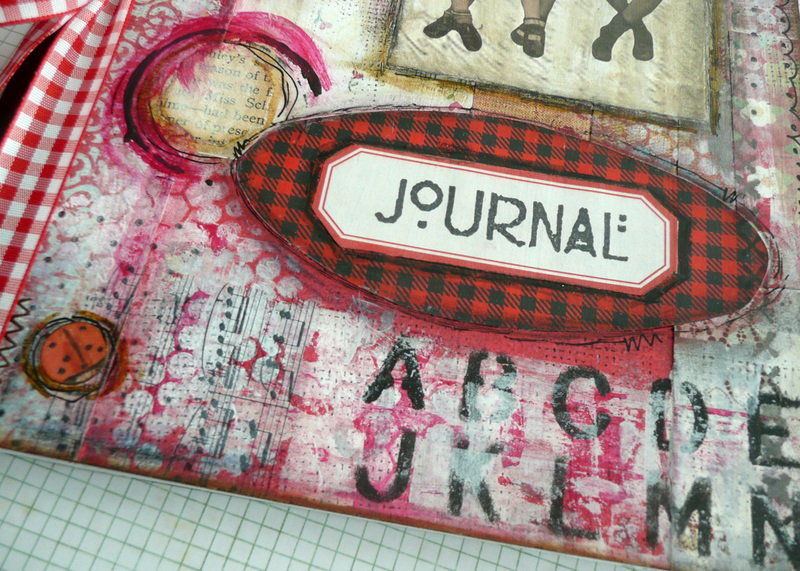 In last Monday's post, I told you about the Altered Journal Swap I participated in recently. 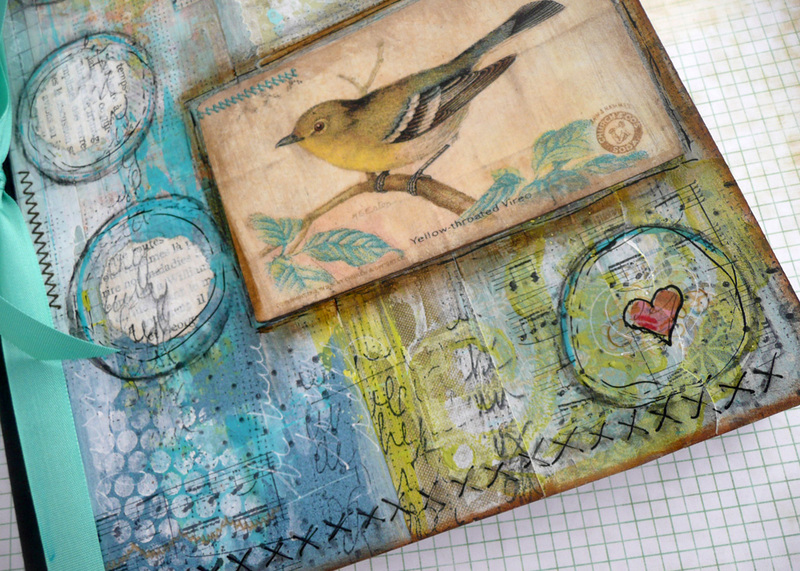 It really was so much fun and I was grateful to be able to use some of my stash of composition books which I've been hoarding for a while. The first journal, shown above, is the one I made for Mary. 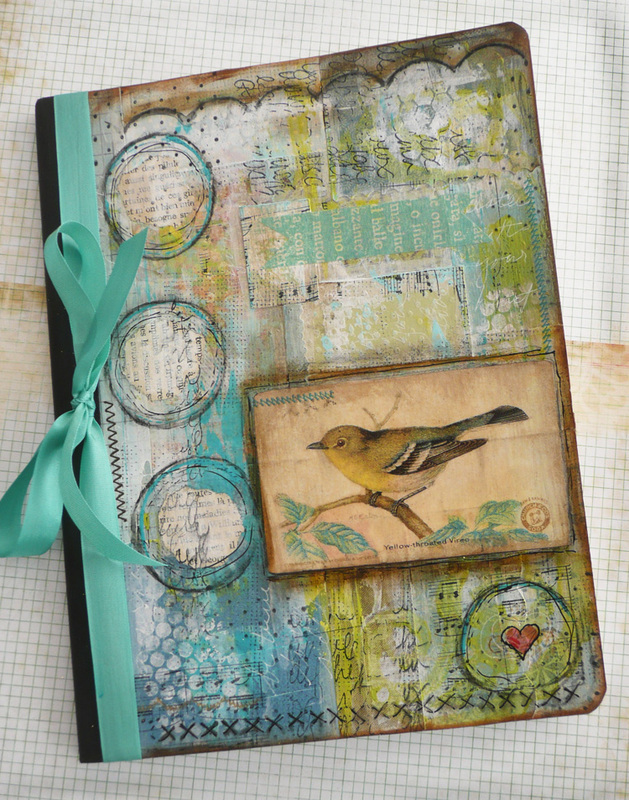 She told me she likes blues and greens, ribbons, as well as bird and vintage themes. Perfect! Because I like all of those things too! 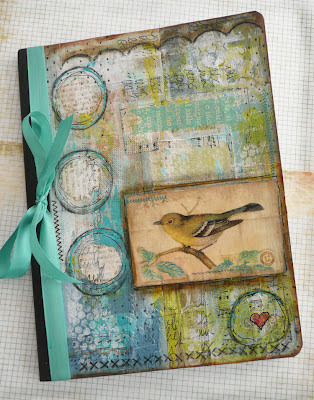 My inspiration for this journal came from this vintage bird image which I had. 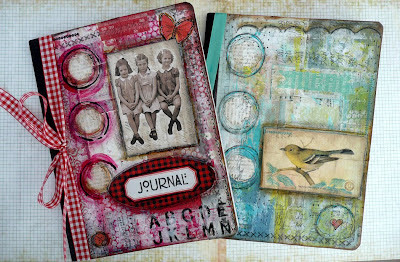 I was taking an online class taught by Jeanne Oliver while I was creating these journals, so I was able to incorporate a lot of the techniques I learned. 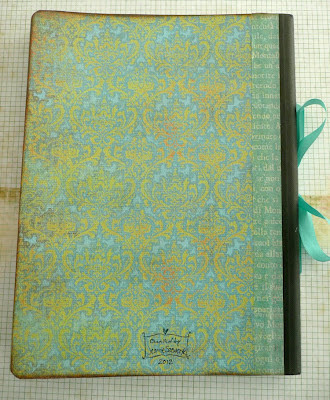 This is the back cover of the journal. 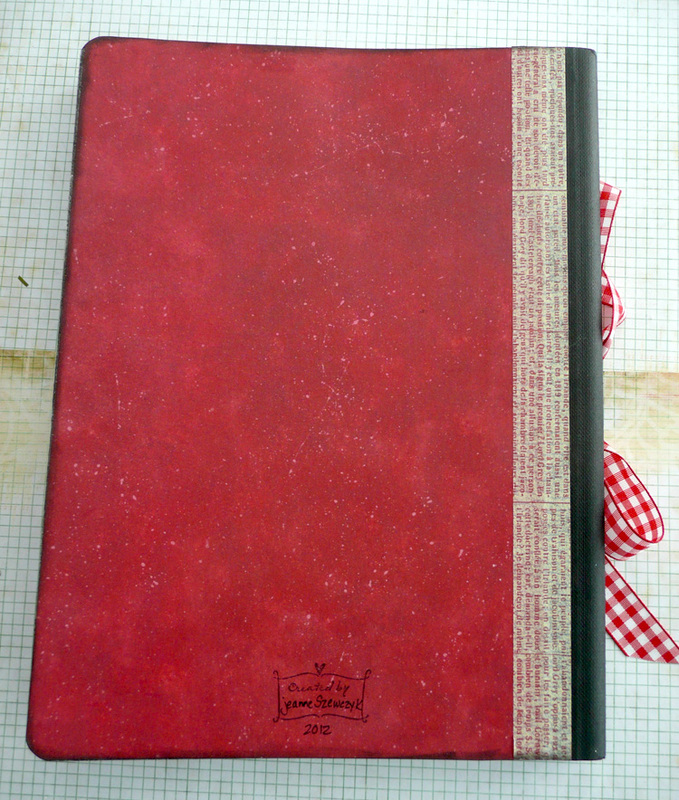 The second journal I created was for Patty. She told me she is a "color-loving red girl" who likes vintage ephemera. This too was great, because I love the color red also. Although I don't have any red in this house, my crafting room at our cottage is decorated in reds. I think red is such a happy color. 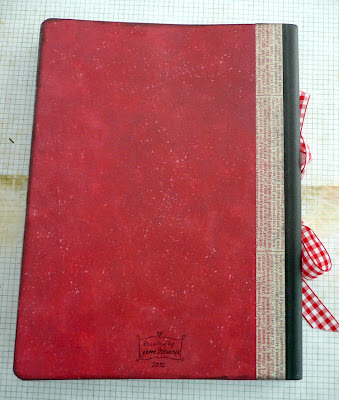 I grabbed my bin of red papers and proceeded to collage the cover of the composition book. 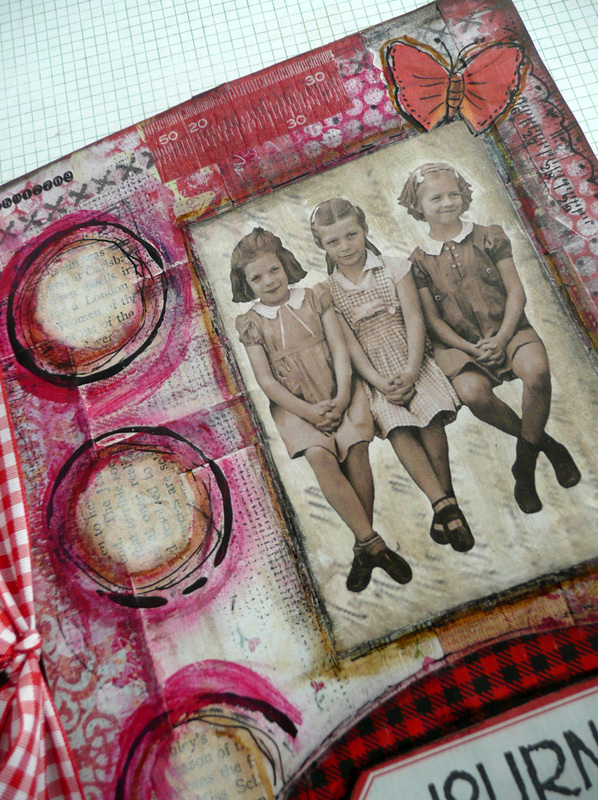 Then I remembered I had this vintage image from a collage sheet I bought from Lisa's Altered Art quite a while ago and decided it would work nicely as a focal point for the cover. I really had a lot of fun with this swap. 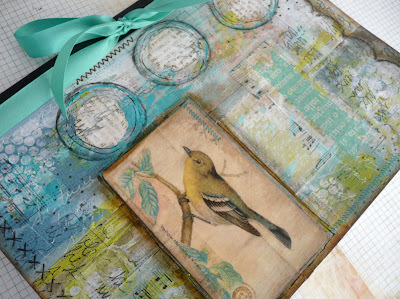 I got to use supplies that I already had in my studio. I got to work with colors that I love. And I got to practice new art techniques that I had learned. What could be better that all that? Those are wonderful! Truly. I think Jeanne Oliver is amazing. I have one of her linen purses and love it. I think I told you I met her at Silver Bella. What a doll and so real! I would have loved to have done her class. Just can't do much right now. It was so nice to come back to your house. Hospice is peaceful but somber. 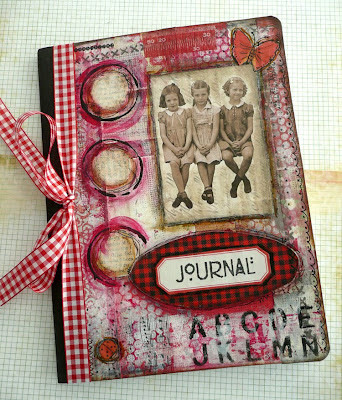 Altered composition books are such great fun to create...Love seeing the ones you made as well as the lovely two that you received! 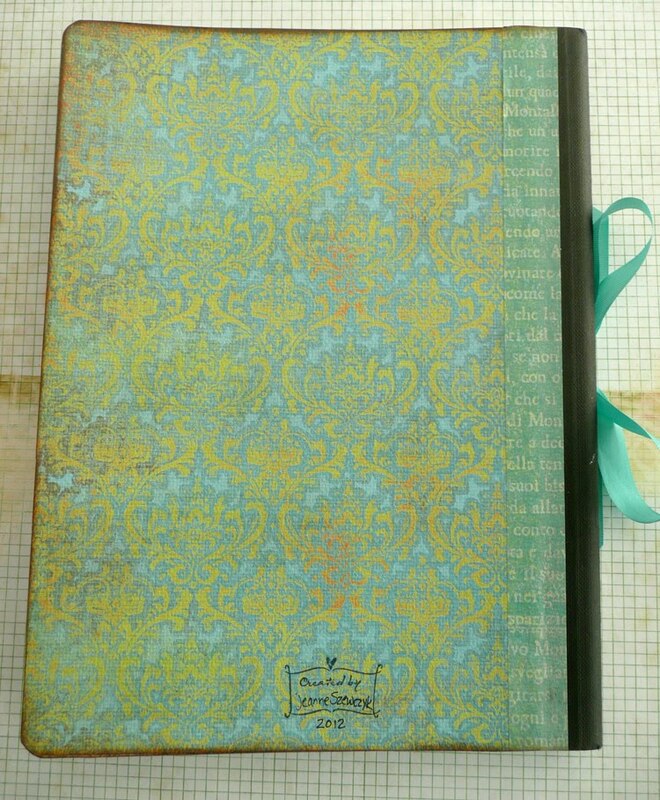 Your journals are absolutely stunning! Wow! Your partners were very lucky girls! Your journals are total works of art! Breathtaking!